If you haven’t heard of Broods yet, you should probably start listening now. With the recent release of their sophomore album Conscious last month, the New Zealand duo–composed of Georgia and Caleb Nott–teamed up with Microsoft to create a new way to experience music. The collaboration is the latest from the Music x Technology artist series, a program that provides opportunities for artists to use Microsoft technology in creating unique experiences for their fans. In the “Heartlines” video, the biodata visuals are subtle, and the geometric shapes created are a little too abstract for such a straightforward love story in comparison to the other special effects featured in the video (ex: the bleeding veins and pumping heartbeats). If you weren’t looking for the graphics beforehand, you might have missed them entirely. Nevertheless, where the Microsoft Band made the most sense was during the Broods performance that rounded up the night at the Lounge. Georgia once again wore the Band as the duo played four songs off their new album, including an acoustic version of “Free.” Behind them was a monitor that displayed similar electric shapes from the video, spinning and evolving in real-time to the rhythm of the songs. It was as if you were watching one of those desktop screen savers that drew mesmerizing shapes in the dark–only the screen was blown-up in size and the visuals were live. The look and feel of the mini-concert was not too far off from what other electropop bands are already producing out there, but the technological means to achieve this style adds a layer of depth and personality to the performance, engaging the audience in a more intimate way with the performer. Broods plans to go on tour with the Microsoft Band, as the biodata gathered from their upcoming performances will be translated into unique lighting and visual displays for the shows. This allows the band to personalize the performance in each new city, as, theoretically, no two shows will be exactly the same. If you ever wondered what your favorite band was thinking or feeling while onstage, this Band may be one step closer to solving that question in a creative and interactive way. 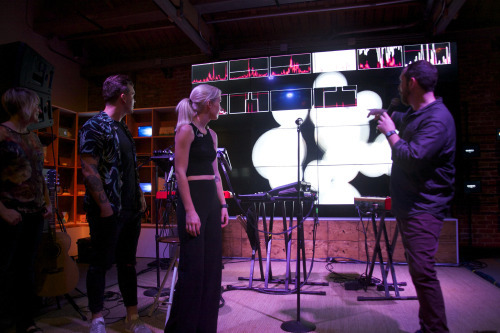 Catch Broods and Microsoft’s latest Music x Technology project at the upcoming Conscious tour, beginning August 1st.